Perth has some swapmeets, or flea markets if you're old school, that have been going since the 80s and some sellers who are probably flogging the same stuff – Commodore 64 anyone? Just kidding. At most swapmeets there are your regulars who rock up week after week – like the stalls with potted plants or the guy who has every electrical cord under the sun, then there are the teenage girls who've cleaned out their wardrobes in an attempt to make some cash for their first overseas holidays and the families who finally got around to cleaning out their cupboards, garage and garden shed. Being a seller at a swapmeet can be a great way to make some extra cash, provided you don't mind getting up at before the sun to make a buck. It can also be a place to pick up a bargain whether it's books, furniture, art, second hand clothes, kids toys and other crap you never even knew you wanted. Perth's 'swapies' are usually run by Rotary and Lions clubs and cost around $10 for a bay for sellers and a gold coin entry for buyers. The general rules remain the same for them all – no selling food (except for the charity sausage sizzle out the front), no new goods (except plants) and no dogs. The busiest times are right before Christmas and those held in carparks have to shut up for the weeks when Sunday trading is on. Quietest times are when there are other big things on, like Mother's Day for example. Tips for sellers – take a thermos of coffee and have a friend visit you at some stage so you can have a toilet break (very important). Take signs or sticky labels and textas so you can adjust prices as the morning goes on. Be prepared to bargain - sometimes it's better to sell if for a couple of dollars less than take it home again. And be realistic about your prices. Have a look on eBay and Gumtree to see what things are selling for – then take at least a third (probably more) off that. Take plastic bags, lots of change and (I can't believe I'm saying this) a bumbag is a pretty good idea too. You might want to put up trestle tables or you can chuck a blanket on the ground. If you're selling clothes it's a good idea to bring a rack to display them on. Tips for buyers - you'll get the best choice if you're early. But you'll get bargain prices if you go near closing time. Haggle! Make an offer – you never know. Why? A great way to make some extra cash. Hi just wondering what swap meets are NOR this wk end? Can you sell new items at any of the swap meets? Morley was the one I was mainly wanting to know but any info as to where I could sell some new and old items would be great. I've been told I'm not allowed to sell my items at Karinyup so any others would be appreciated. ps. Despite the start of Sunday trading in Perth, all of these swapmeets are still on. However the ones at shopping centre carparks now finish earlier (before 11am). There has not been a swap meet in Kardinya - Kardinya Park Shopping Centre car park for a long time. This information is incorrect. Try the Wanneroo Council for specific details about the Wanneroo swapmeet. Good luck. Karinyup now runs 730-1030, and sellers out by 11am. Moved to the undercover carpark in north east corner of complex. Hi, I got this in the mail. I just bought a bay, helps to have a place where to get rid of a few things! seems it is for a good cause too!! Do you have unwanted items/goods in your garage and would like to sell. This is a great opportunity!!!! Hi, I am looking for a baby bjiorn newborn carrier, do they sell these at karrynup or galaria swap meet and if so what time does it start? Am looking for a carboot sale but saw this swap meet page. 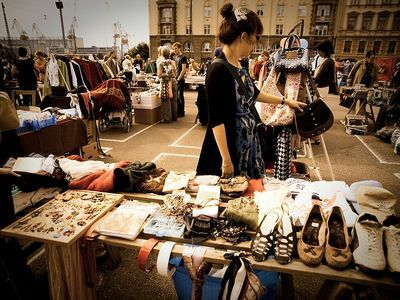 Two questions, 1 What is there and difference between a swap meet and a car boot sale and a swap meet 2 Is there any cost in having a stall with items for sale. Can local honey be sold at these markets. Just FYI, the City of Vincent now holds a Bike Swap Meet twice a year - one in March and then in October as part of their BIKE WEEK events. Proceeds go to Bikes For Humanity (send bikes to Africa). The next one is being held on Saturday March 21st (sellers from 9am, buyers from 10am until 1pm). Francois Sauzier 9273 6558 or travelsmart@vincent.wa.gov.au for more details. How do i book for a stall at belmont forum? would you know where the belmont flea markets have moved to??? Hi, I was wondering if you are available to share this on radio this coming Sunday 24th March. Please can you get in touch. Hi, do you know if Wanneroo swapmeet is on tomorrow 03/03/13 and if so how much do they charge if you are a seller? I would like a stall at Belmont Forum Carpark. Who do I contact to book one? are there any swap meets in the perth area on saturdays? Don't bother trying to sell at Morley, Sunday trading has made to become too restrictive.